Tiering and ranking analysts is a topic of growing interest this season, with webinars on the topic announced by our friends at the IIAR and Spotlight. The basic reason for ranking analysts is clear. Rather than rank analysts emotionally, or just point to past meetings, we need to have analyst lists which are ranked according to a formal process that show their business impact. A formal process can not only be documented but also it can be justified objectively to your colleagues. We have four major opportunities when we rank analysts. – Focus. Which are the analysts with the most influence? In that context, we need to see which individuals are really impacting your market. A large firm without a base in your market, or a visible analysts who don’t really work with clients in your market, should not get valuable one to one personal attention from your top executives. – Yield. Which of these analysts is most responsive to your time and energy. – Accuracy. Analysts change coverage. Firms change in importance. Vendors change markets. All these changes are faster than before. That’s why organisations need to have regular processes for adding and removing analysts. – Clarity. 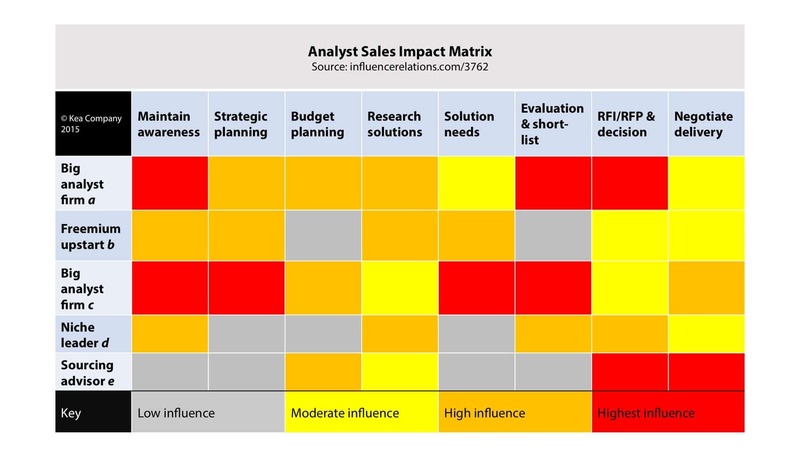 Our Analyst Sales Impact Matrix shows how these findings can be explained and presented quickly and easily. As AR comes under greater scrutiny, past relationships are not enough as a guide. Over time, more people get added because they have had contact with PR or with executives who are champions of those analysts. Eventually, lists get so long that you start spending time with analysts who have less influence than they justify. Very often squeaky wheels will push you, or your colleagues, for times. Indeed, as the list grows then people end up feeling they don’t have time to prioritise. For some firms, you might end up thinking you have 50 or 100 top tier analysts. It’s certainly hard to reduce the number of analysts also because AR people want to be helpful. Squeaky wheel analyst firms are more aggressive than ever in calling you, and your colleagues. Sadly, the resources available and limited, especially the time of top executives. Indeed, we also want to use that resource usefully and to be able to put more effort into the most influential analysts. With only a subjective feel for who is important, AR managers struggle to prevent lists growing out of control. In the absence of a real list, lots of firms misallocate their AR resources and, in particular, spend almost all of their AR effort on analysts who generate a minority of the analyst value for the firm’s target clients and channel partners. Of course, need to have different tiers, and for a different solution or product line some analysts might be in different tiers. Personal: Top tier analysts get full, one-to-one attention. Inbound responses get rapid responses and more personalised curation of the information sent to them. In practice, that means some organisations will have more than one list. The key list will be the list of people we are doing outbound communication with. Interactive: Tier two analysts are still important. They get one-to-few opportunities like summits, social gathering and webinars. We need to track those people closely because they can easily move up or down in impact. Impersonal: Tier three analysts get only one-to-many automated communications like newsletters, portal access and possibly one-to-many events under the understanding that they don’t try to push in an take time from executives. Some of them might event be none-to-many analysts, who get online access but get almost no opportunities for personal interactions. All of this requires a solid ranking methodology that matches up influential analysts and the resources available: that must include both the firm’s budget to spend with the analysts’ firms, executive time and the AR team’s time. Those three resources can be allocated slightly differently, but always with a focus on what gives you the best return on your investment. However, there might be a separate press reference list. Because some analysts who are not that important can be major targets for the media, we might give them a bit more attention and, for example, upgrade them from the third tier to the second tier. Similarly, there might be a separate list of people who consuming insight from. Of course, all of this also requires focus in terms of your own business’s priorities. You need to balance focus on the legacy core business and your company’s growth platforms. It will often make sense to front-load communication with analysts in priority growth markets with some effort transferred over from mature markets. All of this might make it sound as if a lot of effort is taken up in ranking the analysts according to their relevance to customers in our priority segments. After tiering those individuals, we then relate that to the resources we have available. The shortlist for tier one has to be the number of people we can honestly and confidently say we can aim to build relationships with. It might be that the first tier has to be a little smaller than we want if we find that many of the top analysts are people who we have not really researched or built relationships with. For many firms, the key ranking variables will be about the firm: does the firm sell to our markets? Are they in the right geographies? Are they selling to our clients? But we also need to look at the analysts’ attributes. How important are we to those individual analysts? Are they newer to the field, and eager to learn, or are they more interested in influencing our executives? This ranking process needs data. Our Analyst Impact Modelling approach involves looking at a wide range of publically-available information (events, sales) and internal data from surveys, like the Analyst Value Survey, that get the insight of clients, salespeople and channel partners. Analyst firms’ account reps are eager to serve us and, while we have to be sceptical of their claims, we can get great insight from them. We can see the research the firms have written, we can ask for editorial calendars for some firms, and as we build relationships with analysts. Social media impact can also be very informative, especially in North America and for analysts who are working on social business and digital collaboration. Duncan, great post! Thanks for giving Spotlight a shoutout. For those who are interested in joining our webinar we’re going to be sharing our thought model and a prioritization tool that can help validate or refine your instincts and will help justify your decisions. We would love to have you join on June 27 at 1pm Eastern, please complete your registration – https://zoom.us/webinar/register/8115289925512/WN_Q1-3KJ51SQqMqu2jEErcWg.